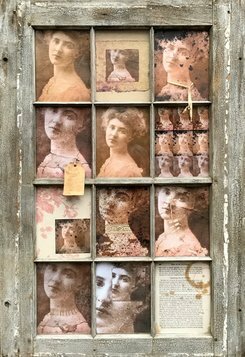 The June Contemporary Art at Historic Northampton exhibition, Contained and Constrained, features hanging and sculptural artworks created specifically for Historic Northampton by Massachusetts-based artists Leslie Lyman and Karen Battles. The artists respond to and reinterpret images and artifacts in the museum collection, informed by the late 19th century book Social Etiquette or Manners and Customs of Polite Society. By looking at each archival item through a lens focused on that era’s asserted social norms, the artists ask each viewer to look beyond the item’s specifics and see it in the context of customs dictated and certainties declared. Each finished artwork integrates and presents items to generate emotional connections for those who, like the artists themselves, reflect upon the conventions that constrained choices in types of clothing, styles of communication, and modes of conduct. This is Lyman’s and Battles’ third time showing their work jointly. Their works, while each displaying each artist’s own distinctive style, share a common focus on vintage items – photographs, letters, calling cards, diary entries, clothing, boxes, books, and the like – long remaining from peoples’ daily lives. The artworks invite free-ranging imagination about the stories behind these items, including their original creation, their subsequent use (including how and why they were kept and preserved), as well as their imagery, texture, materials, age, and presentation. Historic Northampton is closed on Mondays and Tuesdays and on holidays and in January.